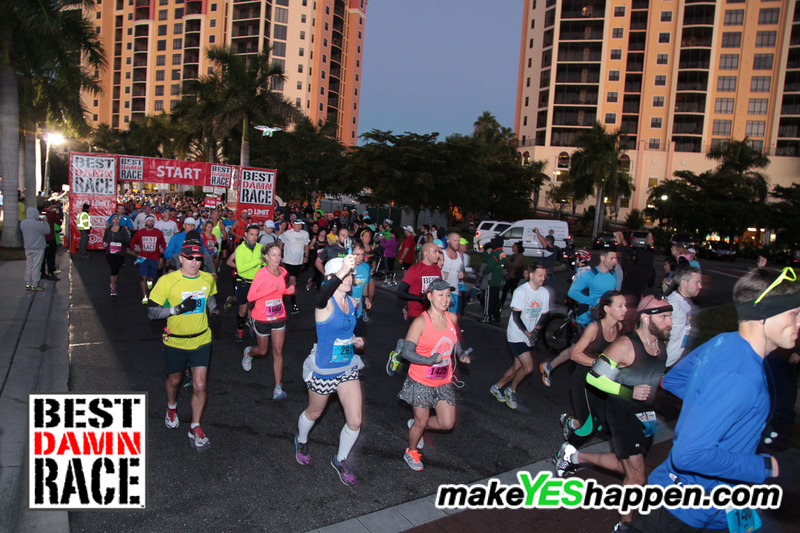 This fall’s “A” race was originally intended to be the Space Coast Marathon – not necessarily a BQ attempt, but definitely a PR attempt, after what happened last year, but after some scheduling/life things got in the way, I transferred my half marathon bib at Best Damn Race – Cape Coral for the full, refocused my efforts, and felt ready to take on my 11th full marathon. I’m in the middle, Mary is carrying the Go-Pro! My friend Mary was also running this race, which was her comeback from having her (adorable!!) son last year. The weather was pretty close to perfect (50ish) with just a slight breeze, and after meeting up in the corrals (self seeded), we set off. For 10 miles, we ran pretty close to side by side, knocking off splits right on pace (nothing over 8:10), and it was just flowing. At water stations, I’d stop and grab a cup, then run and catch up with Mary, and once, she even stopped at a portapottie and made her way back up with ease. Of course, I mentioned that things changed at Mile 10. And changed, they sure did. The bottoms of my feet were burning up, like with hot spots. This concerned me, as I (foolishly) had not trained with the shoes I was wearing for anything longer than 10 miles (in fact, they had been my PR shoes a week before, which was one of the reasons I chose them – rookie fail). 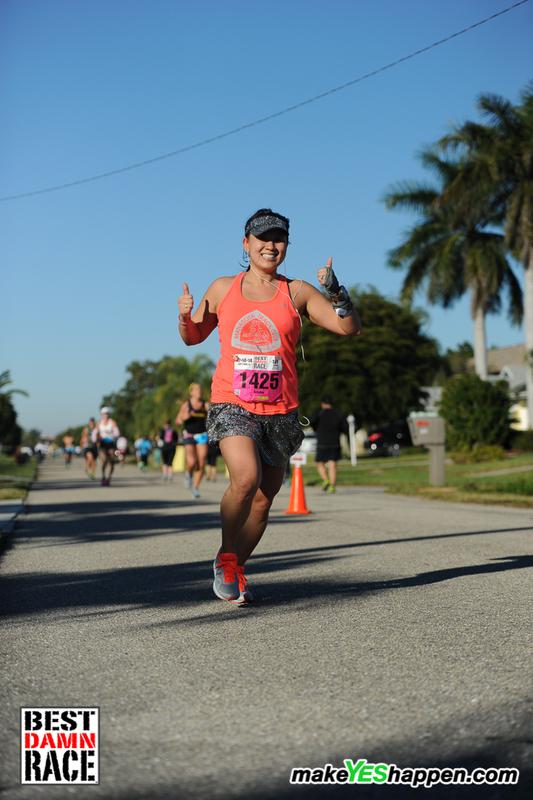 Right after Mile 10 clicked off, I began to see Mary’s figure pull forward…and for the next 6 miles, I was practically shoulder to shoulder with some loud breathing, hard footfall runner (UGH) so I turned up my iPod a little to try and drown him out. I kept on that damn pain train, though. There was no turning back. Through Mile 22 or so, I was still pulling for a PR (sub 3:43) but inevitably, it just was not meant to be. 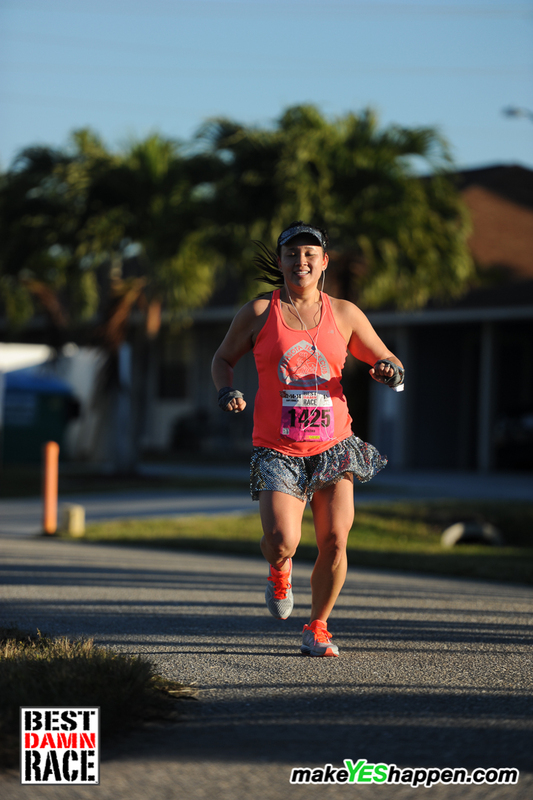 What pulled me through to the finish last week was the uplifting spirit and good nature of my fellow runners. Completely. Several of us in my immediate vicinity appeared to be experiencing similar fatigue, and when any of us would pass each other, we would wave, flash a grit tooth smile, or even utter a motivating phrase to one another (“We can do this. You’re looking strong. Let’s keep going!”) On top of that, the volunteers at the aid station were ON THEIR GAME! Along with clapping, cheering and nuun distributing, their smiles and quick clean up (such a clean and clear course! ), each aid station was like a beacon of positivity for me, even as I felt my time goals slipping away. I knew I was almost back to the main resort area of the Cape Coral Harbor, but my feet were just so angry with me. I let my playlist push me forward (my friend/coworker Tonya’s suggestion of “Little Bird” by Annie Lennox was especially uplifting) and repeated to myself: just keep moving. The final stretch was a straight, long road. The finish area was next to a big condo building, and it felt like it kept pulling farther away. By this point, the temperature had risen to around 70, but the sun made it feel much warmer. I was wiping sweat from my face, and concentrating on just one thing – one foot in front of the other. I grimaced a bit to see 3:33 (the time goal I had envisioned earlier in the race) tick off with more than 1.2+ miles to go, but what was done was done. I had given all that I could, took a chance, and was not going to reach my goal that day. I was disappointed, but not defeated. The second blow was when it finally dawned on me that sub 3:43 was also not going to happen. I had clearly not run the tangents (final mileage ended up being about 26.7 that day). Still, I was breathing. I was moving. I was alive. I was going to have a Best Damn Finish, dammit! Onward. I mustered up anything that was left inside of me when I heart the finish line announcer’s voice, and made my way down that finisher’s chute. I could see Beth and Caitlyn cheering, and I threw those hands up. It wasn’t the finish that I had imagined, but it was still a finish that I could be proud of! I finished in 3:45:12, my third best marathon time, of 11, and 7th sub-4 of my running career. I still had a lot to be thankful for. I hobbled out to the finisher’s area, and caught up with some friends, as well as stopped to chat with some of the runners I had finished “with” and found that one of the ladies who had been near me for most of the race was 51 (!!) and had qualified for Boston! YESS! And another woman had traveled all the way from Minnesota to run, and loved it. And…all of a sudden, anything negative iota I had left about my race was gone. It made me think about an article I had read by one of my running heroes, Meb Keflezighi recently, and it lifted my heart and spirit to think that as runners, we’ve all felt a range of emotions – in training, in racing, and on the ride back from a big race…but it’s what we do with those thoughts that defines us, and what sets us apart. We chose how to move forward – even when our minds try to lead us astray. We are goal getters. We are driven. And we WILL reach what we strive toward – it just takes everything that we have – and it will be worth it. For a review of this race (logistics, swag, stuff not in this personal account of the event), please visit my Bibrave review! I think you are amazing!! 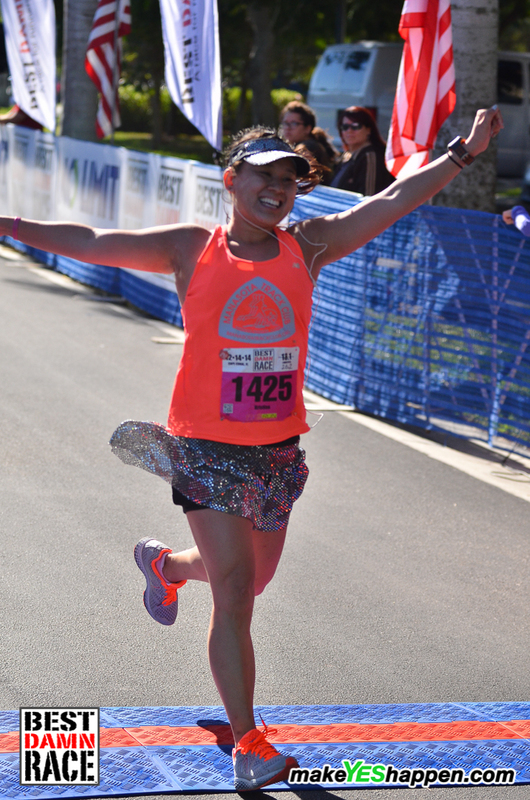 And I adore all your happy race photos!! So cute! You definitely rocked this one! Sorry to hear you did not have the race you wanted either! I think it was very mentally challenging going out on the same course the second time with so few people (at least when I was out there) Hope your feet are feeling better!